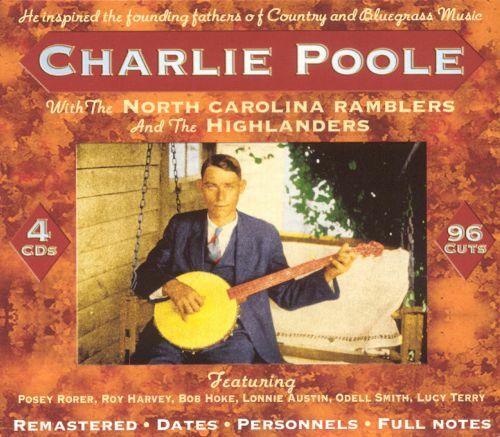 Charlie Poole wasn't a particularly brilliant banjo player (although his later three-finger-style picking would set the table for the advent of bluegrass banjo a couple of decades after his death), and he wasn't the world's greatest vocalist either, but he had a certain devil-may-care charisma that made him a superstar in the string band era of the 1920s. Poole's greatest talent -- aside from an ability to go on long drinking sprees and to manage to be at the center of things even in his absence -- was in his song adaptations, which drew from sources outside the standard Appalachian fiddle tunes and reels, including pop, ragtime, and blues. This extensive 96-track, four-disc box set from Britain's JSP Records collects the lion's share of his recordings on Columbia, Poole's label from 1925 until his death in 1931 at the age of 39. 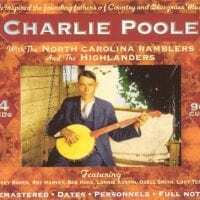 Also included are a handful of cuts Poole made under the table for Paramount (where his North Carolina Ramblers were called the Highlanders) and Brunswick (which saw the band disguised as the Allegheny Highlanders). Working at various times with fiddlers Posey Rorer, Lonnie Austin, and Odell Smith, and usually with guitarist Roy Harvey, Poole favored loose-limbed arrangements of songs like "Leaving Home" (a version of the timeless "Frankie and Johnny"), "White House Blues" (a brilliant song about the 1901 assassination of President McKinley),"Shootin' Creek" (a North Carolina variant on "Cripple Creek"), "Ramblin' Blues" (a reworking of W.C. Handy's "Beale Street Blues"), and "If the River Was Whiskey" (which grafted Sleepy John Estes' "Diving Duck Blues" to Handy's "Hesitation Blues"), producing a body of songs unlike any other in the mountain string band tradition. That most of these songs dealt with drinking and carousing with a certain reckless blues edge was telling, since Poole's heart eventually gave out after a long, last multi-week drinking binge, a rock star-styled death for a man who lived life in a headlong rush. Nearly a hundred songs might be too much for the casual listener, but serious fans of the string band genre and Poole's unique contribution to it will welcome this generous set.